Average capacity factors for the Nation's fleet of natural gas combined-cycle power plants have increased steadily since 2005. Increased use of these plants means that facilities that previously served peaking or more often intermediate load needs now contribute more significantly to baseload electricity needs. 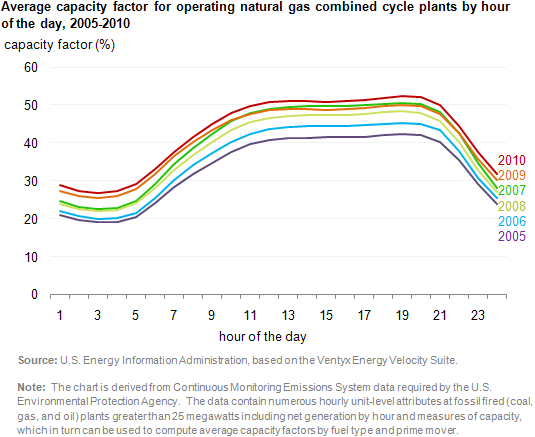 The chart shows that the average utilization of natural gas combined-cycle power plants has increased across hours of the day. Between 2005 (purple line) and 2010 (red line) average capacity factors for natural gas plant operations between 10 p.m. and 6 a.m. rose from 26% to 32%. For peak hours—from 6:00 a.m. to 10:00 p.m.—capacity factors averaged about 50% (the red line) on a national basis in 2010 compared to about 40% in 2005. Both increasing domestic supply of natural gas and lower natural gas prices, together with the high efficiency of combined-cycle power plants, have contributed to their increased use.